Wild senna (Senna marilandica) of the Pea/Bean (Fabaceae) Family is an erect, herbaceous (though rather shrub-like) perennial. This plant occurs in the US from Texas to Nebraska and east and south to the borders, but is absent from far northern and northeastern states. Wild senna is found throughout Arkansas but is less frequent outside of the highlands. Formerly known botanically as Cassia marilandica, the species is also called Maryland senna based on the specific epithet “marilandica,” indicating from where the species was originally described. It grows in a variety of well-drained soils in open to partially sunny areas of woodlands and sheltered areas of prairies. Established plants are drought tolerant. 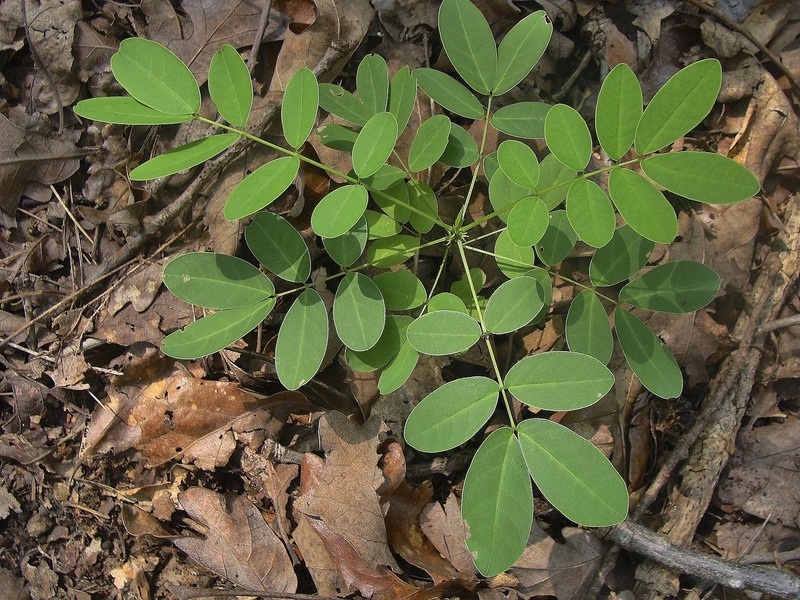 Wild senna, growing up to about six feet tall, has one or more unbranched stems from a shallow, fibrous root system. The entire plant is typically hairless (glabrous). The stout green stem is smooth and shiny. A pair of small linear to lanceolate stipules at the base of each leaf stalk falls off as leaves mature. Lower leaves may drop in dry weather conditions. Crushed foliage has a strong scent. 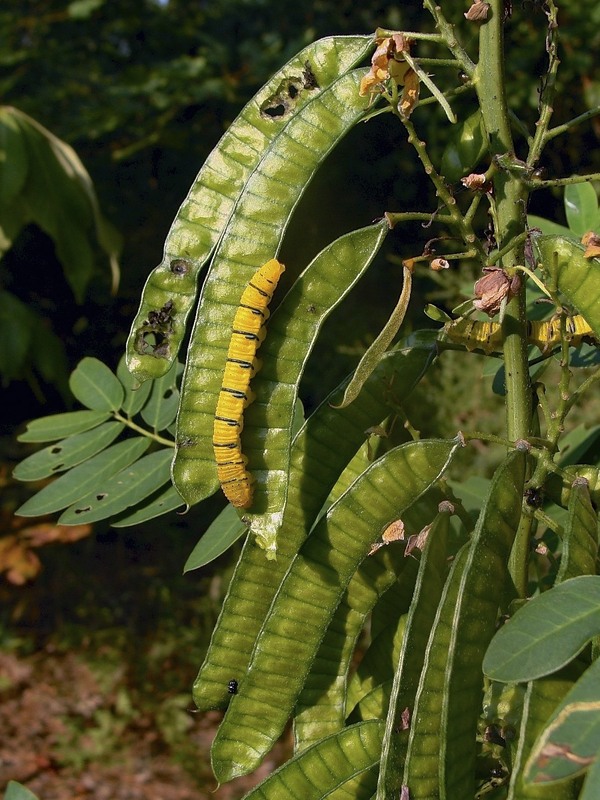 Wild senna has alternate, even-pinnately compound leaves with four to eight pairs of opposite leaflets, including a terminal pair. Occasionally, the lowest “pair” consists of only a single leaflet. The rachis, up to about 9 inches long, is grooved on its upper surface. Leaflets, on short petiolules, are oblong to elliptic and up to 2½ inches long and ¾ inch wide with a fine soft tip. Bases of leaflets are generally rounded, but somewhat oblique, with the edges facing away from the stem narrowing more abruptly to the petiolules. The upper leaf surface is medium to dark dull green with a hair-line of lighter color along the margins of the leaflets; the lower surface is light green. The leaflet venation is pinnate and raised on the underside. The upper sides of leaves feels smooth, almost waxy. The lower leaf surface is also smooth except textured by the raised veins. The base of each leaf petiole is enlarged and stub-like with a black, domed gland on the stub’s upper side. Leaves higher on the stem, in the inflorescence, tend to have a second gland at the lowest pair of leaflets. Ants and small to tiny bees collect nectar from these glands. Photo 1: A young wild senna plant with stipules showing down the stem. A hair-line of lighter color shows at margins of leaflets. Photo 2: Upper and lower surface of pinnately compound leaves. Note oblique leaflet bases and enlarged petiole at junction with stem. Red arrow indicates an aborted flower raceme. Inflorescences (racemes) develop in mid-summer from leaf axils on the upper one-fourth of the stem. 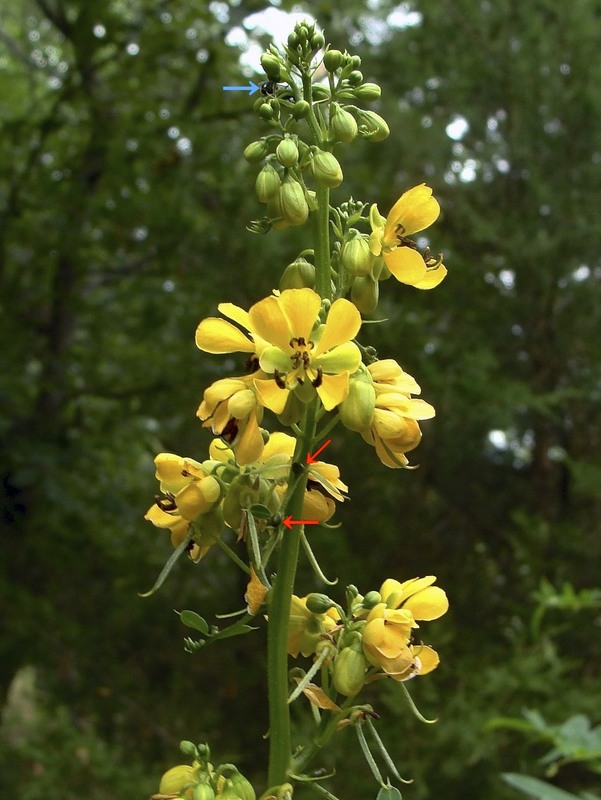 As earlier, lower racemes are in bloom, additional leaves and flower clusters grow at the tip of the stem, forming a panicle (a raceme of racemes), crowded with peduncles (the stalks of the racemes), pedicels (stalks of the flowers), stipules, leaves, and domed glands. Leaves subtending each raceme become increasingly smaller and eventually underdeveloped toward the top, but nectar glands persist. Each raceme has several to 12 round buds. Photo 3: Inflorescences mature from axils of upper leaves initially and from bottom to top. Lower racemes may develop later under favorable conditions. Beautyberry (Callicarpa americana) can be seen in background. Flower buds open into ½ inch bright yellow flowers. Flowers have five ovate, yellow-green reflexed sepals, five yellow spreading petals, and ten greenish filaments with dark red anthers. The five petals are in a flared group of three above and two below. The ten stamens are in three groups with distinct shapes; namely, group of three at bottom (by the pistil) has the longest filaments and large curved anthers, a group of four at center has shorter filaments and straight anthers, while a group of three stamens at top are short and almost petal-like. The central stamen of the bottom group is the smallest in the group so that the pistil is well exposed. The pistil’s superior ovary is slender and curved. Flowers do not produce nectar, but some tiny bees laboriously collect pollen, primarily from the lowest group of stamens. Photo 4: Leaves subtending upper racemes are greatly reduced. Two nectar glands can be seen on reduced leaves along stem (red arrows). A bee collects nectar from a gland at top (blue arrow). Developing seed pods are already present in the lower racemes. Fertilized flowers produce dangling, flat, pea-like pods that are 2½ to 3 inches long and ½ inch wide. Pods, partitioned into 15 to 20 rectangles with one seed per partition, are bright green initially. At the end of the growing season, the entire plant becomes a dark gray to black and persists for months. Rather than splitting to disperse seed, it seems that the pods just disintegrate (are eaten?) on the stalk. Seeds, less than ¼ inch long, are smooth, dark-colored and ovate with a pointed end. Photo 5: Partitioned seed pods eventually become black and remain on erect stems for months. Caterpillars of Cloudless Sulphur shown (Phoebis sennae). 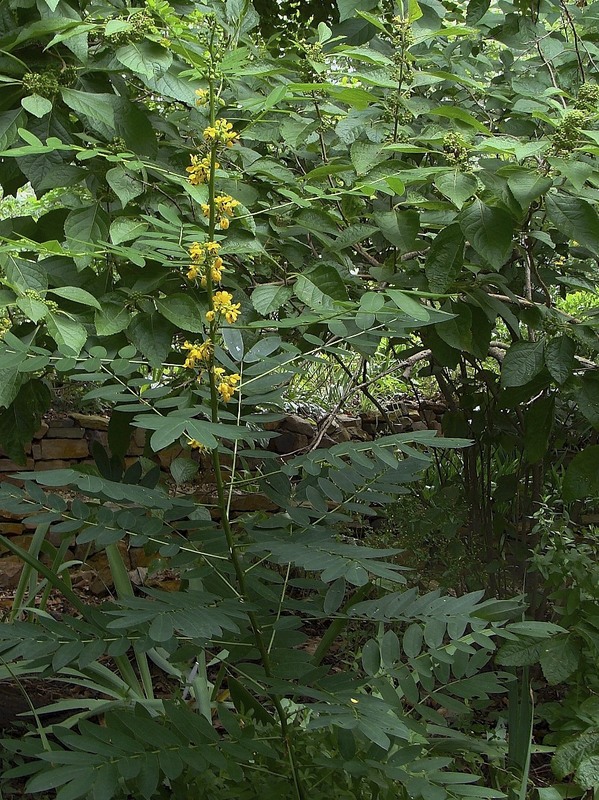 For a garden or natural area, wild senna is a distinctive low maintenance plant that is not favored by deer. It prefers protection from full-day hot sun. Along with its large compound leaves and clusters of bright yellow flowers, its stems and seed pods add noticeable structure and texture. Wild senna is not noted to be weedy, but if more plants are not wanted, seeds pods can be easily removed at the end of the growing season. It is a larval food plant for several sulphur butterflies and silver-spotted skipper. 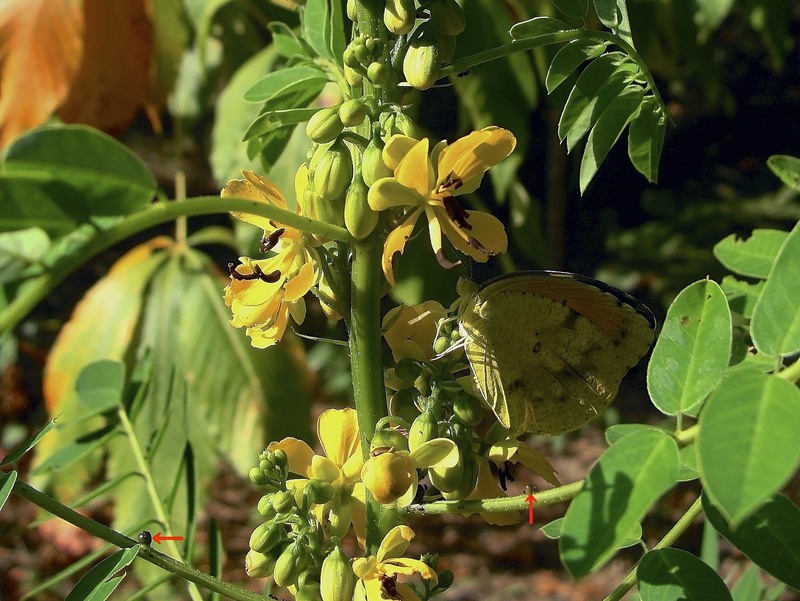 Photo 6: Wild senna is a host plant of Silver-spotted Skipper (Epargyreus clarus) and several Sulphurs, including Sleepy Orange (Abaeis nicippe), which is shown. Second nectar glands can be seen on two leaves (red arrows). 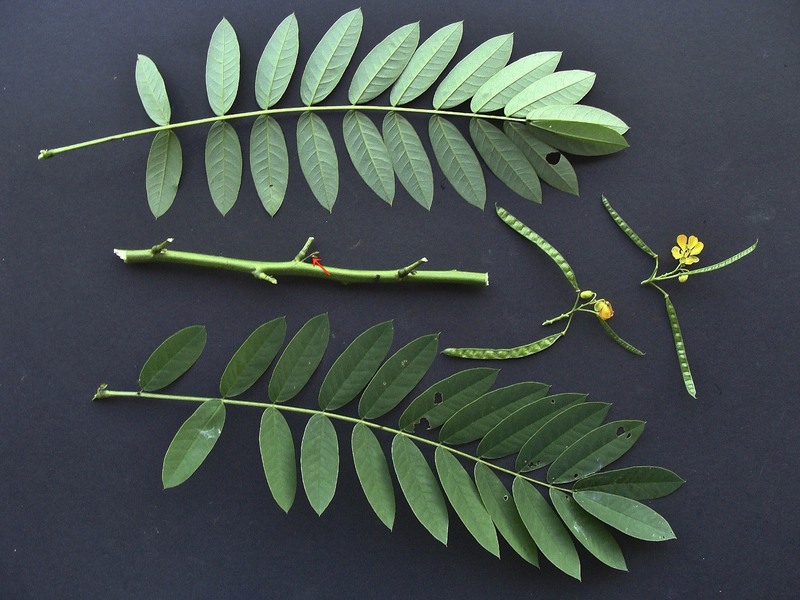 This entry was posted in Know Your Natives, Native Plants, Wildflowers and tagged Fabaceae, Know Your Natives, Senna, Senna marilandica, Wild Senna. Bookmark the permalink.